Great Scot! Looks like some sort of dastardly villain has put a curse on this party and made everyone dull. 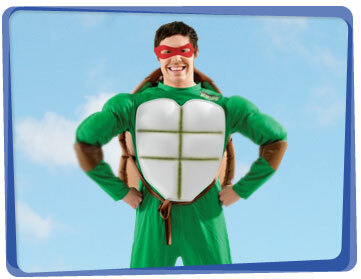 Invite the Yabadoo Super Heroes for hire to your kids birthday party to save it from destruction! 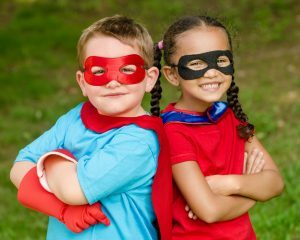 With 18 years of experience at Superhero themed parties, you can be assured that we have the perfect selection of superhero birthday party ideas including a magic show, treasure hunt, games (such as pass the parcel), balloon twisting, face painting and more. Need something special or unique for that conference or corporate event? Our Brisbane superheroes for hire don’t only entertain at parties. Under our belt, we have years of experience providing high quality fun for all kinds of occasions. You know that the entertainer is successful when the adults can sit back and enjoy themselves while the kids are being entertained and having fun. That is what happened yesterday at our party, and it's all thanks to your fantastic entertainer. Many thanks again! - Nicole K.
Give each superhero a kryptonite by tying a green balloon to a string, then tying it around the superhero’s leg. On the go signal, the superheroes save each other by popping as much kryptonite as they can. They can stomp on it, but they cannot use their hands to pop it. Once a superhero’s kryptonite has been destroyed, he/she steps out of the game and goes to a designated safe place. It’s a good non-competitive game that allows the children to practice teamwork.